Monitoring is the cornerstone of IPM. A well designed monitoring routine can provide a wealth of information useful in the current and future seasons. reduced dependence on chemicals; hence IPM is a step towards sustainable agriculture. For practical purposes, IPM programs can develop through three stages. Some crops or situations may be unsuited to Stage 3, but will benefit from Stage 1. Stage 3, the highest level of commitment, means investing time and money into encouraging biological agents. A decision to use broad spectrum pesticides in a Stage 3 IPM program cannot be taken lightly, as this may undo the work of the previous months or even years. e.g. Avatar®/Steward®, Success®, Pirimor®, Mimic®, Insegar®, Neem products etc. Seek specialist advice from suppliers of BCA's and consider employing an IPM crop monitoring specialist*. Monitor crops regularly and learn to identify your pests and beneficials while doing so. Determine what level of pest you can tolerate. 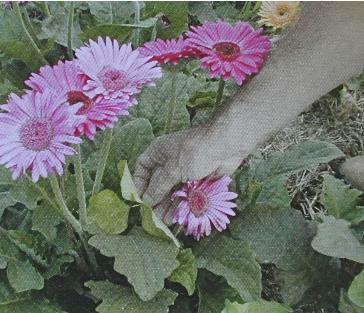 Replace broad spectrum sprays with biological or more selective insecticides if available. Identify any local BCA's that are likely to assist you - these can be very sugnificant. Determine which mass produced BCA's are suitable for your pests, crop and district. Determine the best times for introducing natural enemies. Ensure chemical residues have had time to disperse before introducing BCA's. Identify other practices which will assist establishment of BCA's. e.g. wind breaks. If appropriate, reorganise plantings and location of plantings to facilitate use of BCA's. Experiment with part of the crop or one planting. *Many of the suppliers of bicontrol agents also provide commercial monitoring services. IPM systems consist of numerous elements with monitoring usually described as the "cornerstone of IPM". Biological controls, cultural practices, nutrition and irrigation management are all important elements. Are there effective natural enemies for the major pests of this crop? Effective natural controls exist for some pests but not others. Are these mass reared for introduction or do they enter the crop from local populations? This will influence management practices. eg. conservation of refuges or alternative crops. What crops or types of vegetation are adjacent to the target crop? 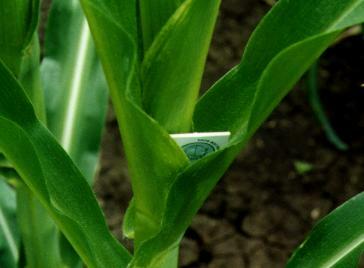 Some crops act as refuges for natural enemies while others can harbour unwanted pests. Is the crop being grown under "organic" or "conventional" classification? While a crop does not have to be grown organically to make use of biocontrol methods. Are there "soft" chemical options for use in conjunction with natural enemies? Soft options are available for some pests and not others. Is the crop life span and environment suitable for natural enemies? It can be difficult to establish BCA's in short lived crops. Are certain plant life stages suitable for natural enemies and others not? BCA's may be most appropriate at a particular stage of the growing cycle. A crop consultant versed in biological control options will help you answer these questions so that an appropriate program will evolve. Each farm and crop has unique characteristics which need to be catered for in developing a program and responding to events as the season progresses. In addition to these questions are those related to cost and practicality and the degree of difficulty controlling key pests with chemical means alone. Do not assume that it is more expensive to use biological control methods. Inoculative release: One or two releases early in pest infestation to control pest gradually. e.g. 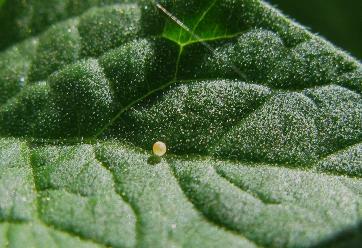 predatory mites in strawberries, Trichogramma in outdoor crops, lacewing in field and greenhouse crops. Regular or dribble release method: Regular small release during likely problem periods, used like preventative fungicides. e.g. P. persimilis is nursery crops, Encarsia in green house crops. Inundative releases: Repeated high rate releases during periods of pressure for quick knock down. e.g. Cryptolaemus beetles, Trichogramma in green house crops, P. persimilis for dosing hot spots of TSM. Combination of above methods: e.g. initial high release rate for quick knock down followed by regular targeted small releases. 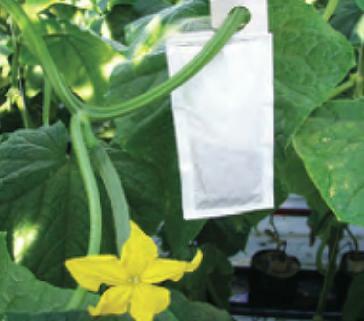 Biocontrol agents are released using a wide range of methods. some as pupae in moth eggs (trichogramma). some are spread loose or in a carrier (persimilis in vermiculite, lacewing eggs and larvae in chaff). Talk to your supplier about the best strategy and release methods for your crop and situation. 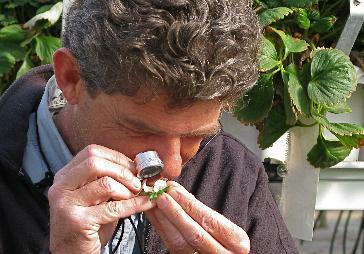 Monitoring for twospotted mite in strawberries. A good 10x hand lens is required for "bug checking". 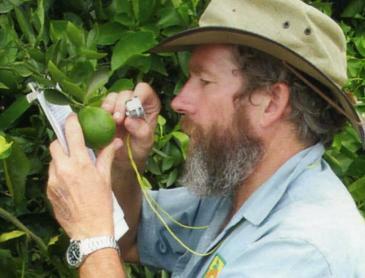 Monitoring involves learning to tell a pest from a beneficial. 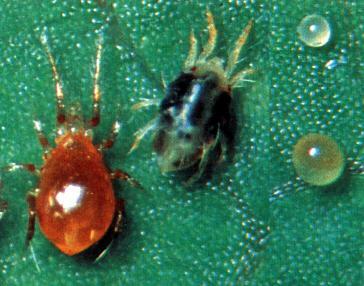 In this case Persimilis (left) is a predator of twospotted mite(centre). While the large egg on the right is a Persimilis egg and the smaller that of TSM. "Black" macadamia nutborer egg parasitised by a Trichogramma wasp. Eggs that are parasitised go "black" about 5 days after they are parasitied. 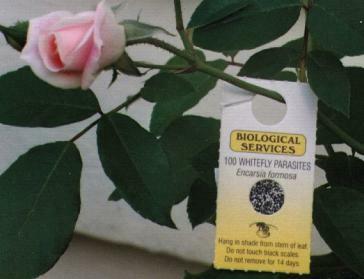 Monitoring that includes an assessment of parasitism rates can save a lot of time and spraying. In citrus, being able to assess the level of parasitism of red scale by Aphytis is an integral part of the monitoring process. 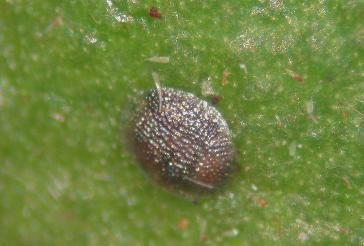 Image shows aphytis pupa exposed by removing the scale cover. The pupa forms after the larva has consumed the scale insect An adult aphytis wasp will emerge from each pupa. Example of a monitoring record sheet that includes Pests and Beneficials and an assessment of moth egg parasitism. 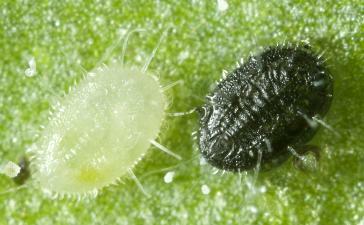 Whitefly nymphs parasitised by Encarsia go black within 2 weeks of being parasitised - faster in hot conditions. The adult wasp will emerge from the black scale by chewing an escape hole. IPM aims to maximise the use of biological control. Other control measures, especially chemicals, must play a supportive, rather than a disruptive role. Chemicals should not be used on a 'calendar' basis but strictly when needed as defined by systematic pest monitoring. Selective rather than broad-spectrum chemicals should take preference. The aim is to produce high-quality marketable produce at minimal cost by intelligently using the various control options to manage pests.